YaleNet - Smart Matters - Second Annual Yale New York BENEFIT SOIREE! 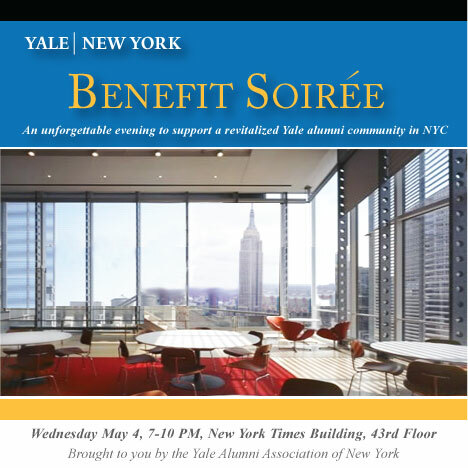 Our much anticipated event is almost here: the Second Annual Yale New York BENEFIT SOIREE, next Wednesday May 4, 7-10 PM in the famed New York Times Building. And be sure to check out our BENEFIT AUCTION online now! Expect breathtaking sunset views over the Hudson, open bar with our signature Bulldog Gin Cocktail, gourmet hors d'oeuvres and an epicurean cheese tasting! Click here to register. See you at the SOIREE!